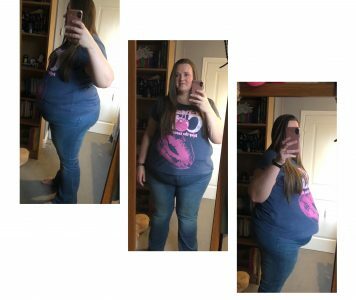 Weekend survival – Half the girl I used to be – my 200lb weight loss journey! I was so busy trying to blog/ Instagram/ Facebook and do about 60 other things at the same time that I forgot my new coffee machine doesn’t cut off automatically like my old one did, resulting in coffee going all over the worktop and floor and me screaming at the machine and waking the neighbours up (who needs a lie in on a Saturday anyway). On the bright side I guess all the cleaning up will have burnt a few extra calories. However after all the cleaning, I just didn’t feel like having breakfast (wrong I know) so I just had my coffee and left the house. So we finally made it into town and I was right – it was difficult to find somewhere decent to eat that sold healthy food. It didn’t help that within 5 minutes of parking up I had been dragged into McDonalds to watch my partner devour 2 double cheeseburgers 😭. I was well behaved and didn’t have anything. After a bit of shopping I remembered a little old fashioned café my mum has taken me to since I was small, the entire décor including tables and chairs hasn’t changed in 30 years! Luckily they have kept up with evolving foods trends and actually had quite a few options available to me. I decided to go for the Ocean platter which was poached salmon, smoked salmon and prawns with salad, prawn marie sauce and bread (I threw away the butter as I didn’t want the extra calories) and it only came to 426 calories. I’m lucky the food was so good and so filling as my fella decided the cheeseburgers had only been a snack and decided to order a large hotdog and side of fries for his lunch. By the time we got home I was absolutely exhausted (I have screws in my ankle that are causing issues and lots of pain). I couldn’t be bothered doing too much for tea but I remembered we had some jacket potatoes with cheese in the freezer that we got cheap from Morrison’s (love my yellow labels) so I got them out with some fajita chicken, peppers and onions. It came to 526 calories, was super quick to make and tasted way better than it looked. I decided I probably hadn’t actually consumed enough calories for the day and so I had a hot chocolate and a Squares rice krispie bar for supper, adding on 220 calories. Saturdays Grand total was 1222cals – that will do me fine! Woke up this morning and I just didn’t feel right. I couldn’t work out what was wrong but I just felt out of sorts. I decided to crack on with my day and off I went to try and track down some bales of wood shavings for my guinea pigs. I don’t know what has happened but shavings are like gold dust around here at the moment. We managed to track some down 20 miles away so off we went. It got to 1pm and I suddenly realised that I hadn’t eaten anything yet and weirdly I wasn’t hungry. We decided to stop at the service station to grab something as I knew not eating at all wasn’t good and so I got a fillet rice box from KFC – 495cals. I didn’t manage to eat it all but I didn’t do too bad. I managed to make a chicken dinner for tea with my partners help. Roast chicken, Yorkshire puds, potatoes, veg and gravy – 510 cals. It tasted great and perked me up for a little while. In all honesty, I probably didn’t consume enough calories today but I feel rotten and so I don’t really care #sorrynotsorry It’s 8:30pm and I’m off to bed. So that was my weekend. My first week is complete and I’m both excited and nervous for my first weigh in tomorrow – I’ll let you know how it goes. Wish me skinny thoughts! Previous Post Only two more days till weigh in and worrying about the weekend. Next Post First weigh in…..